Auctions offer a wealth of interesting material and, more and more, people are discovering that they are a good source of furnishings at much less than retail cost. 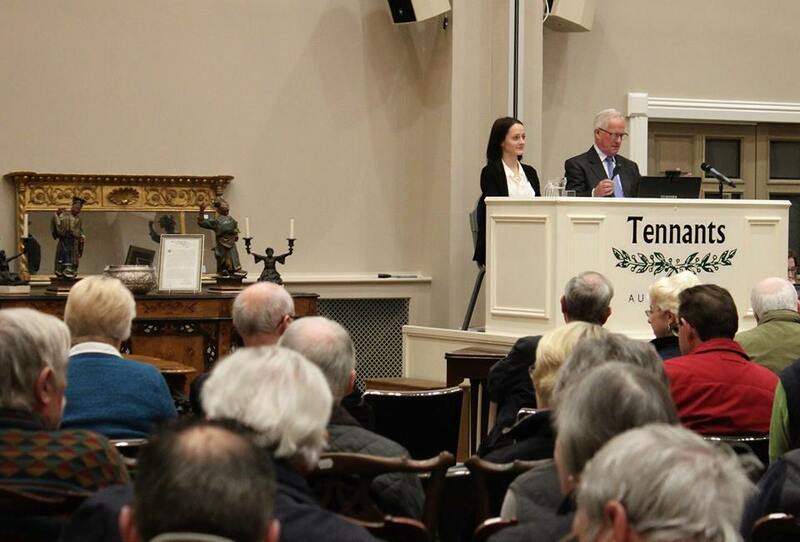 A fine art auction taking place at Tennants of Leyburn, North Yorkshire. Not only are antiques good value, but buying and selling at auction is much easier than many people imagine. For those unfamiliar with the saleroom process here is a simple step-by-step introduction. Armed with these essentials you have nothing to fear. It is simply a matter of locating your local auctioneer using our searchable directory. Whether you are buying or selling, the rest is up to you. Auctioneers spend much of their working lives assessing the value of possessions. Most carry out valuations for insurance, probate and tax purposes and provide detailed written reports where required. A valuation fee is charged but may be waived if the items are later sold with the same auctioneer. If a formal valuation is not required, most auctioneers will give a verbal valuation on items brought to the saleroom and many conduct regular valuation clinics which are free of charge. Once the item reaches the saleroom a catalogue description, together with a pre-sale estimate, is prepared. This will include essential information such as size, shape and an expected price range called the estimate, but when dealing with an important object a cataloguer may also undertake research and seek the opinions of an acknowledged expert in the field. As the sale day approaches each item is given a lot number and prepared for display during the viewing periods. Collection: If auctioneers offer this service, they will charge a fee plus VAT. Loss or Damage: The conditions of sale usually allow an auctioneer to disclaim responsibility unless caused by direct negligence. Insurance: It is usual to take out insurance to cover for loss or damage during transportation, handling and storage. Establish the level of cover and the value of the goods covered. Storage: An auctioneer usually charges storage fees for unsold lots if they are not collected within an agreed period or submitted for the next sale. See their Terms and Conditions. Lot Fee: Sometimes there is a small fee charged per lot, whether it sells or not. Reserve: The agreed price, below which the auctioneer will not sell the lot. Some vendors agree to sell at "the auctioneer's discretion" when it is difficult to set a reserve. The risk for the vendor is that the lot may sell below its true market value. Other Charges: There may also be charges for photographs in the catalogue and a percentage charge for items withdrawn from the sale or left unsold. Be sure to ask before the sale for an illustration of all the possible charges so they do not come as a surprise afterwards. Vendors' Commission: The auctioneer charges a sales fee on each lot sold. This is agreed prior to sale: it can pay to shop around. VAT: All charges are usually subject to VAT. Payment: The auctioneer usually forwards payment, minus fees, within 30 days of the sale. Advertising: Publicity is the lifeblood of an auction. It is one of the responsibilities of an auctioneer to advertise and market a sale properly and make personal contact with potential buyers when important pieces come up. 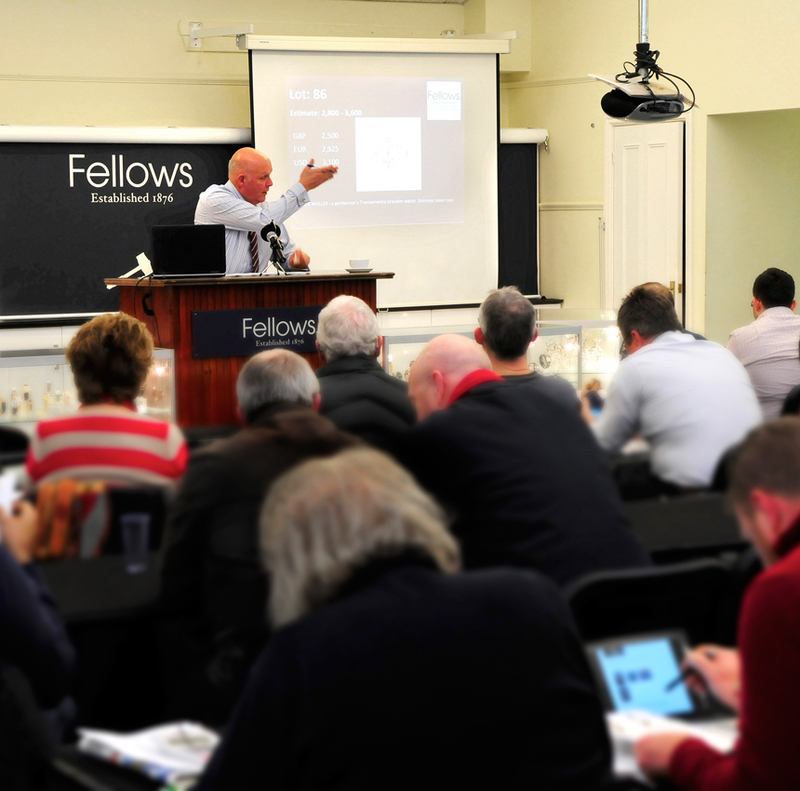 Stephen Whittaker of Fellows taking bids at one of firm’s auctions in Birmingham. Image credit: Fellows Auctioneers. In many ways viewing is the most important part of the auction process. This is the time to discover faults, not after the sale. Typically an auction will be open to public view for two or three days prior to sale day, and probably for a short time before the sale itself. It can take some time to view a large sale and the morning of the auction is not always the most convenient time to be looking at the backs of big bookcases or going through an entire case of jewellery. In some circumstances an auctioneer may offer private viewing by appointment. Lots are frequently damaged by clumsy handling so ask a porter to move heavy items for you or open delicate pieces. Saleroom regulars know that the porter is an important 'behind the scenes' person. As the name implies, it is the porter who is responsible for making sure that the goods are in the right place at the right time. But he or she must also see delicate pieces through the hazardous process of viewing, display lots as they are sold and, in some instances, execute bids on behalf of clients. When making a bid, it is assumed that you have satisfied yourself in advance as to the condition and description of the lot and the conditions of sale. The former is usually done through attending the viewing, the latter through obtaining a copy of the catalogue or a print-out of the sale conditions. Remember the final check. While most auctioneers will take a reasonable view if goods turn out not to be as described, the standard conditions of sale assume that the buyer has inspected the lot and is happy with it. Most auctioneers provide a condition report for potential buyers unable to attend the saleroom. This should give details of wear, damage and restoration but a written report is no substitute for viewing the object in person. There are a number of ways of bidding at auction: in person, via the auctioneers, over the telephone, or, in many cases now, over the internet. The traditional way is to bid in person in the saleroom. It is usually sufficient to raise a hand to enter the bidding, and the auctioneer will accept a nod of the head to confirm further bids, but he/she will typically ask for a paddle number before the sale is confirmed so it is advisable to register as a bidder before the sale. Bidders at the sale are best placed to gauge the mood of the room and assess the competition. Having viewed the sale some people, including professional dealers, elect to make their bids by telephone. This ensures anonymity and allows them to conduct other business on the same day. If you book a telephone bid, a member of the saleroom staff will contact you a few lots before the item is due to come up. Make sure you are available to take the call. Once bidding begins on the lot they will relay what is happening in the room and pass your bids to the auctioneer. It may not be possible to bid by telephone on low-value items. A more common form of absentee bidding is to leave a commission bid. This is also known as leaving a bid with the auctioneer, or leaving a bid 'on the book'. To register a commission bid you will need to fill in a form indicating the lots you are interested in and the highest price you are prepared to pay. During the sale the auctioneer will execute commission bids against those in the room and on the telephone. Increasingly auctioneers are offering yet another way to bid, and one which is becoming more popular as buyers come to appreciate its appeal. Online bidding allows you to follow an auction as it is happening via the internet and bid in real time against those in the room or on the telephone. To participate in this way you need to register your details before the sale just as you would at the saleroom. Typically, the lot being sold will be shown on screen with the level of bidding displayed alongside. For the internet bidder it is then simply a matter of clicking on the mouse to register a bid. Auctioneers will usually charge a fee for using this service (for example, 3% of the hammer price) so check before bidding. Not every sale is catalogued, but for those that are, each lot should be sold as catalogued. If an auctioneer is uncertain as to the exact nature or date of a lot, they may give a more general description. In the auctioneer's opinion, a work by the artist. In the auctioneer's opinion, probably a work by the artist. In the auctioneer's opinion, a work by an unidentified artist working in the artist's style and during the period of the artist's life. In the auctioneer's opinion, a work by an unidentified artist working in the artist's style, contemporary or near contemporary. In the auctioneer's opinion, a work executed at that time and in the style associated with that artist. In the auctioneer's opinion, a work executed at that time and in the style associated with that location. In the auctioneer's opinion, a work by an unidentified artist working in the artist's style but at a later date, although not of recent execution. In the auctioneer's opinion, a work by an unidentified artist working in the artist's style and of recent execution. In the auctioneer's opinion, a copy by an unidentified artist of a named work by the artist. A work catalogued with accompanying dates e.g. 1577-1640 relates to the identification of the particular artist and is not proof of attribution or indicative of authenticity. The term signed and/or date and/or inscribed means that, in the auctioneer's opinion, the signature and/or date and/or inscription are those of the artist. The term bears signature and/or date and/ or inscription means that in the auctioneer's opinion that artist's name and/or date and/or inscription have been added by another hand. This is the lowest price at which the vendor will sell a lot and is usually not disclosed to bidders. If the reserve is not reached, the lot is "bought in" (withdrawn from sale) though this may not be obvious to bidders. The price or range of prices printed alongside the catalogue description at which the auctioneer believes the lot might sell. Auctioneers sometimes give artificially low estimates to encourage bidding. There are no guarantees that the lot will achieve the estimate, but it could also sell way above it. Anyone intending to bid needs to register with the auctioneers before the sale. In return for basic information (typically contact details and a credit or debit card number) the saleroom office will issue a bidding paddle with a number. The unique bidding number not only makes it easier to administer the sale, it helps you to bid clearly. Despite the myths, raised eyebrows, scratched noses and pulled ears are not part of the bidding process. Auctioneer Clive Stewart-Lockhart conducting a sale. The lot is sold when the hammer falls, but under certain circumstances an auctioneer may re-open the bidding. Full and clear title will not usually pass to the buyer until the lot has been paid for, but each lot is usually at the risk of the buyer once the hammer has fallen. Packing is not always available, so make sure you are prepared. Goods will only be released after arrangements for payment have been made. Check beforehand which forms of payment are accepted. A charge made by the auctioneer to the buyer as a percentage of the hammer price. This fee is usually subject to VAT. The hammer price and buyer's premium plus VAT on the premium. The buyer should establish the rate of buyer's premium and other add-on costs such as VAT and factor them into prices prior to bidding. VAT is only payable on the hammer price if goods are being sold on behalf of someone registered for VAT in their role as a vendor. Lots consigned from outside the European Union may also incur additional charges: look out for symbols denoting this in the cataloguing. Living artists and the descendants of artists deceased within the last 70 years are entitled to receive a resale royalty each time their work is bought. The right applies only when the sale price reaches or exceeds the sterling equivalent of €1,000 and is calculated on a sliding scale. Please note ARR is calculated in euros. Auctioneers will apply current exchange rates. Royalties are also capped so that the total amount of the royalty paid for any single sale of a work cannot exceed €12,500. ARR is exempt of VAT. An auctioneer will usually make it clear how soon after a sale a lot must be collected and what the storage fees might be for any delay. Buyers who wish to collect purchases some time after the sale might consider taking out insurance for them while they are in storage. Failure to collect within the agreed deadline may lead to purchases being resold by the auctioneer. If an auctioneer offers delivery, buyers will need to factor in the cost if they do not want to remove purchases themselves. Increasingly, as many items are bought by buyers from far afield, auctioneers will be happy to arrange packaging and mailing for a fee. Some will offer this service themselves or use a specialist shipper. The original and most authoritative listing of upcoming UK auctions can be found on the Calendar section of our website. The online calendar is fully searchable by date, region and keyword. You can also search for auctions in Ireland and the rest of the world.